CCIR-NYC - What changes in climate are projected for the region? What changes in climate are projected for the region? A warming trend has been observed since 1900 in the New York metropolitan area. Global climate models (GCMs) project that the rate and amount of warming, as well as the frequency and severity of extreme events such as heat waves and droughts, will increase over the twenty-first century. In addition, sea-level rise would lead to more damaging coastal floods, salinization of aquifers, loss of coastal land, and other effects. Over the past 100 years, temperature in the New York metropolitan region has warmed nearly 2°F (~1°C) (Table 1). This warming trend is based on an average of data collected at 23 weather stations in New York, New Jersey, and Connecticut. The regional warming trend is greater than the rise of about 0.7°F (~0.4°C) observed for the nation as a whole, and it is also greater than the rise in global near-surface air temperature of about 1.1°F (0.6°C). Precipitation has also increased slightly over the past century with a tendency towards increased extremes. Table 1. Climate change in the New York metropolitan region. Based on data in Rosenzweig and Solecki, eds., Climate Change and a Global City, 2001. Figure 1. 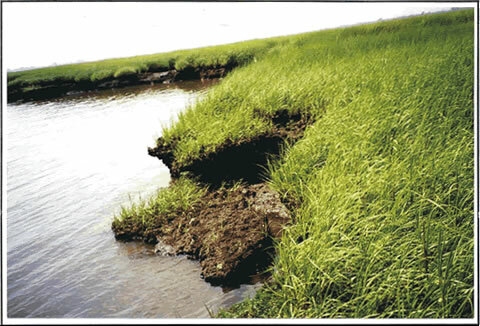 Rising sea level is contributing to the erosion of wetlands. Source: Hartig et al, Wetlands, in Climate Change and a Global City, 2001. Sea level has been rising along the East Coast of the United States since the end of the last glaciation. The rise in the twentieth century can be attributed to both natural and anthropogenic (human-driven) factors. About half the observed rise is related to ongoing geologic subsidence following the end of the last glacial period and about half is related to the warming trend of the twentieth century. This warming trend has caused thermal expansion of the upper oceans and has also led to the melting of mountain glaciers, both of which contribute to observed sea-level rise. At present, the rate of relative sea-level rise in New York City is 0.11 inches/year (2.73 millimeters/year) (Figure 1). Sea level in the New York metropolitan region is rising more quickly than global sea level, probably due to ongoing regional subsidence. Future sea-level rise would lead to more damaging coastal floods. Global climate models (GCMs) project that the rate and amount of temperature rise in the region will increase over the twenty-first century due to anthropogenic greenhouse warming (Table 1). Regional warming is projected to occur in all seasons. Recent downscaled projections with a regional climate model are shown in Figure 2. Regional summertime temperatures are projected to rise 2.12 – 2.75°C by the 2050s. The GCMs do not agree in the magnitude and direction of precipitation changes. Overall, there is substantial potential that gradual changes could be punctuated by increases in extreme events such as floods and droughts. Figure 2.Sea-level rise, measured at the Battery in New York City, 1920 - 1997. Source: Gornitz, NASA Goddard Institute for Space Studies (NASA GISS) Climate Impacts Group, 2001. With projected climate change, sea level in the region may rise 4.3 – 11.7 inches by the 2020s, 6.9 – 23.7 inches by the 2050s, and 9.5 – 42.5 inches by the 2080s. Future sea-level rise would lead to more damaging storm floods and a marked reduction in the flood return period in coastal areas (Figure 3). The 100-year flood would have a probability of occurrence, on average, once in 80 to 43 years in the metropolitan area by the 2020s, once in 68 to 19 years by the 2050s, and once in 60 to as often as every 4 years by the 2080s. Figure 3. Reduction in 100-year flood return period due to sea level rise. Source: Gornitz, Sea Level Rise and Coasts, in Climate Change and a Global City, 2001. The New York metropolitan region periodically experiences heat waves, floods, and moderate droughts. Global climate change may increase the frequency, severity and/or duration of these extreme weather events, which could negatively affect the economic stability of the region as well as individual health and safety. Recent heat waves, droughts, and floods can serve as examples for what we can expect to experience in the future. The summer of 1999 was punctuated by a series of heat waves that imposed heat stress and extra energy demands throughout the New York metropolitan area. High temperatures were widespread in most of the eastern portion of the nation in July. It can be expected that heat waves, like the ones experienced in 1999, will become more frequent in the tri-state region as temperatures rise. Accompanying the summer heat in 1999 was a major drought that affected most of the Northeast. It was the worst drought in the United States since the Dust Bowl droughts of the 1930s. In some parts of the metropolitan region, there was no measurable rain for more than two months. It was the driest and warmest July on record. In the future, as the frequency of heat waves increases, it can be expected that there will also be an increase in droughts. Scientists use the Palmer Drought Severity Index (PDSI) to compare anomalous dry and wet years to normal years and to identify relative droughts and floods at particular places. The PDSI suggests that climate change will bring more droughts to the region (Figure 4). Figure 4. Projected change in the Palmer Drought Severity Index for New York City. Positive values indicate an increase in the frequency of floods and negative values indicate an increase in the frequency of droughts. Source: Major and Goldberg, Water Supply, in Climate Change and a Global City, 2001. At the end of August 1999 after months of drought, there was a heavy rainstorm. Between 2.5 and 6.1 inches (6.4 and 15.5 cm) fell in flash floods that crippled the region’s mass transport system the following morning. Up to 5 feet (1.5 meters) of water covered the power tracks in various parts of the New York City subways, stopping service and stranding passengers on numerous lines. Like heat waves and droughts, floods are expected to increase in size and frequency as the climate changes. Flato, G.M., G.J. Boer, W.G. Lee, N.A. McFarlane, D. Ramsden, M.C. Reader, and A.J. Weaver. 1997. The Canadian Centre for Climate Modeling and Analysis global coupled model and its climate. The Canadian Centre for Climate Modeling and Analysis. Atmospheric Environment Service. University of Victoria, BC. IPCC (WGI). 1996. "Climate Change 1995: The Science of Climate Change: Contribution of Working Group I to the Second Assessment Report of the Intergovernmental Panel on Climate Change". J.T. Houghton, L.G. Meira-Filho, B.A. Callander, N. Harris, A. Kattenberg, K. Maskell, eds. Cambridge University Press, Cambridge. Johns, T.E., R.E. Carnell, J.F. Crossley, J.M. Gregory, J.F.B. Mitchell, C.A. Senior, S.F.B. Tett, and R.A. Wood. 1997. "The second Hadley Centre coupled ocean-atmosphere GCM: Model description, spinup, and validation". Climate Dynamics 13:103-134. Karl, T.R., R.W. Knight, D.R. Easterling, and R.G. Quayle. 1996. "Indices of climate change for the United States". Bulletin of the American Meteorological Society 77(2): 279-292. Rosenzweig, C. and W.D. Solecki (Eds.). 2001. Climate Change and a Global City: The Potential Consequences of Climate Variability and Change - Metro East Coast (MEC). Report for the U.S. Global Change Research Program, National Assessment of the Potential Consequences of Climate Variability and Change for the United States, Columbia Earth Institute, New York. 224 pp.